Modernizing classic buildings to match the needs of 21st century use is a challenging assignment. Our work is indicative of our ability to integrate historical integrity and new technologies. 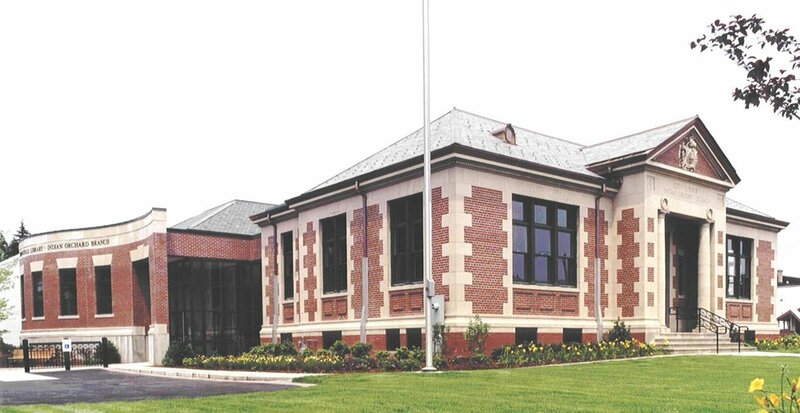 A renovation and expansion of the historic century-old Carnegie Library, the project included plaster repair, effective laylight in place of the original skylight, new standing seam roof and a revisioned front entry that reflects the classic style of the building. After demolition of the two existing additions to the original library, a two-story addition was built, housing most of the new library and library services. A striking lobby with high ceilings joins the Carnegie Room to the new addition, housing the children’s room and young adult room, a 150-seat community meeting room, computer lab, local history room, and a variety of reading nooks and spots for quiet study. The library now features large arrays of heat-rejecting glass, infusing the space with natural light. Designed to meet LEED standards, the historic building has been awarded LEED Silver certification. Renovation of the existing 4,180 square foot library and construction of a 5,324 square foot addition designed to compliment the historic integrity of the original structure, built in 1890. In addition to bringing the library into compliance with the Americans with Disabilities Act, the Lilly Library now includes an enlarged Children’s Room, a public meeting facility, and more accessible space for the growing volume of materials and technologies available for public use. Additional parking, utility upgrades and landscaping were designed to accommodate the expanded facility. Programming, design and construction administration services for the restoration and renovation of historic detailing in the main rotunda room and adjacent spaces. The building is listed on the State Register of Historic Places and all work was done in compliance with the Secretary of the Interior’s Standards for the Treatment of Historic Properties. Feasibility Study for renovations, improvements and expansion of an existing 7,510 s.f. three level brick library and an adjacent 6,353 s.f. church to create a single, accessible library facility of 18,000 s.f. in the town center. Historic restoration of the existing 5,700 s.f. library constructed in 1908 and listed on the National Historic Register and new construction of a 4,300 s.f. addition. The project was designed and constructed in compliance with the Grant Eligibility Guidelines of the Massachusetts Historic Commission. Dismantling and reconstruction of the tower stonework, masonry restoration of the chapel building, rebuilding of the original clock, recasting of the eleven original bells, and reengineering of the belfry to accommodate the future installation of a forty-two bell carillon. The restoration work on the 115 year old building was the recipient of a 1999 Preservation Award from the Massachusetts Historical Commission. Major renovations to Building 104 at STCC Technology Park were made for the new facility which will accommodate 250 students in Grades 9-12. Renovations included demolition of existing interior construction & MEP systems and the construction of new classrooms, offices and other related educational spaces within the 32,000 gsf building. The project also included a new elevator; exit stairways; MEP and fire protection systems; and replacement of existing Kalwall with new aluminum windows. Site improvements under a separate project included new driveways, parking lot & sidewalks.